Birthday Sweets delivers two of our best-selling chocolate specialties – 16 ounces of our famous Peanut Butter Wings and a 6 ounce Chocolate Pizza Slice with birthday sugar decorations. 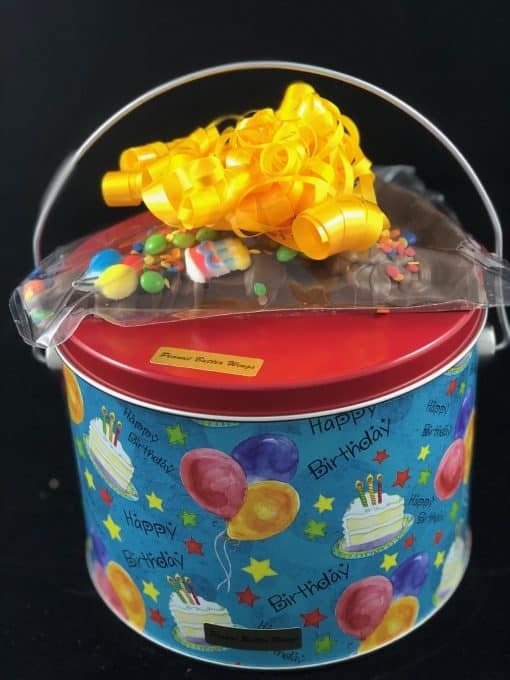 Best of all, Birthday Sweets comes in a reusable, handled metal tin with a fun birthday design. 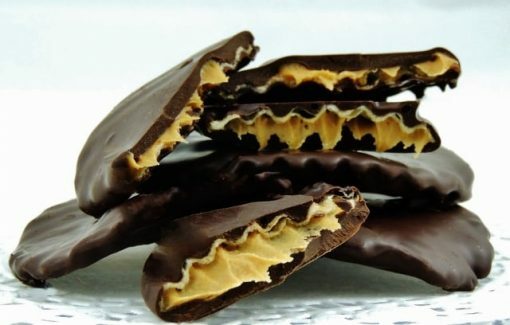 The Chocolate Pizza Slice blends gourmet milk or dark chocolate with homemade English toffee while the Peanut Butter Wings are crisp, rippled potato chips covered in creamy peanut butter and drenched in chocolate. So good! It’s the perfect birthday surprise. Birthday Sweets delivers two of our best-selling chocolate specialties – 16 ounces of our famous Peanut Butter Wings and a 6 ounce Chocolate Pizza Slice with birthday sugar decorations. 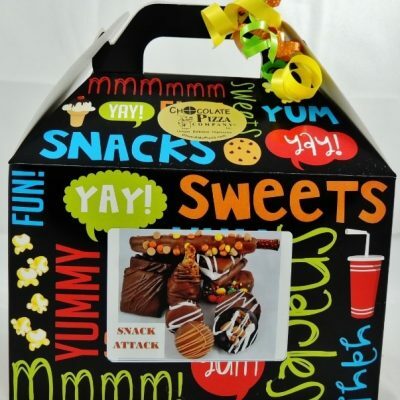 Best of all, Birthday Sweets comes with a reusable, handled metal tin with a fun birthday design. The Chocolate Pizza Slice blends gourmet milk or dark chocolate with homemade English toffee while the Peanut Butter Wings are crisp, rippled potato chips covered in creamy peanut butter and drenched in chocolate. So good! It’s the perfect birthday surprise. 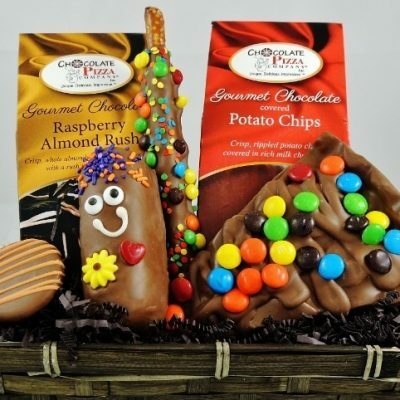 Featured on Food Network, Hallmark Channel’s Home and Family show, CNBC’s “On the Money”, Pickler & Ben show with country star, Kelly Pickler, Chocolate Pizza Company is Central New York’s largest chocolate maker and a rising national brand. Owner, Ryan Novak, started as a dishwasher when he was 15 years-old and at age 21 took over the small chocolate shop in his hometown of Marcellus, New York. His vision was to transform the company into a household name and with features by Forbes, People and Entrepreneur magazines, he is on his way to that goal. Chocolate Pizza Company’s website, ChocolatePizza.com, attracts orders from chocolate lovers on 6 continents and its chocolate specialties have been enjoyed by A-list celebraties, Hall of Fame athletes, rock and roll legends, Supreme Court Justices, and top business and political leaders. The company uses the highest quality Swiss-style chocolate available. They temper the chocolate to give it that snap, shine and velvety mouth-feel that are all characteristics of fine chocolate. 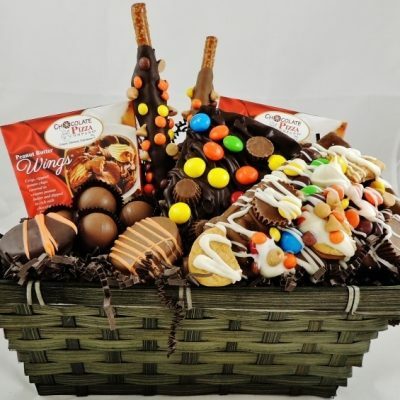 Once tempered, they blend in homemade English toffee and top it with a variety of candies or nuts before sealing it in cellophane and serving it in a custom pizza box. 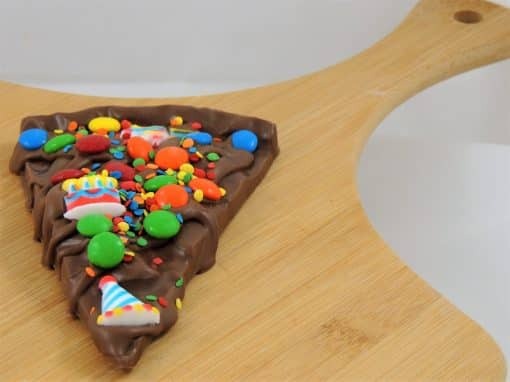 Chocolate Pizza and Peanut Butter Wings make the perfect gift for birthday sweets, holidays, weddings or special occasions. Located just minutes from Syracuse, the company ships nationwide year-round.